Generally, in all walks of professional life, the last thing you want to feel after having a meeting with someone is confused. That’s really the only point of a meeting. To lessen any confusion you might have. That’s my working theory, at least. But then I’ve never been in a meeting with Todd Haley. 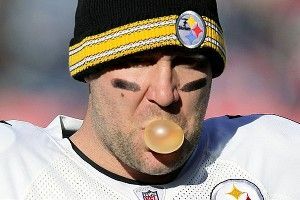 Pittsburgh Steelers quarterback Ben Roethlisberger went on the Rich Eisen Podcast on Tuesday. He was asked how things were going with Haley, who recently replaced longtime Steelers play caller Bruce Arians as offensive coordinator. Love Ben’s use of air quotes when referring to throwing the ball too much, love the slightly derisive reference to “Steeler football” and especially love him calling himself confused despite going through this meeting process with Haley. Bruce Arians’s system, which seemed to get increasingly vertical and occasionally hallucinatory as speedsters like Mike Wallace and Emmanuel Sanders came into their own, was very much tailored to Roethlisberger’s playground football sensibilities. The plays Arians called seemed like an extension of the big quarterback’s footballing personality. Haley is, of course, a capable and accomplished play caller. But he also is known for thinking of himself as such. There will be plenty of meetings, on the field and off, to come between the two. It’s worth keeping an eye out to see if they can get on the same page. Is the Puck-Over-Glass Rule the Dumbest Regulation in Sports?